Coverage: Finals live on BBC One (5 September, 13:00-14:30 BST) and BBC Two (6 September, 12:00- 14:15 BST), reports on BBC Sport website and app. 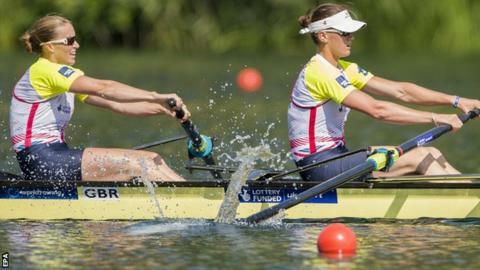 Helen Glover and Heather Stanning will defend their world title in September after being named in the GB Rowing squad for this year's World Championships in France. The pair are among a 66-strong squad for a regatta that also serves as the Rio 2016 qualifying competition. The Olympic and European gold medallists are overwhelming favourites having gone four years unbeaten. "We are still findings areas of our rowing to improve," Stanning said. Britain won four golds in Amsterdam last year, with the men's four and eight and the para-rowing mixed coxed four all attempting to successfully defend their titles. The eight remains unchanged for a third successive regatta, having responded to defeat by Germany in May's European Championship by beating their rivals to World Cup gold in both Lucene and Varese. Imogen Walsh will go in the women's lightweight single scull and Kat Copeland will partner Charlotte Taylor in the double, while 2014 world silver medallists James Foad and Matthew Langridge will team up in the men's pair. Canada, Great Britain and Australia (top to bottom) will all battle it out for men's and women's Eights gold, with tough competition from Germany, New Zealand and the US, amongst others.